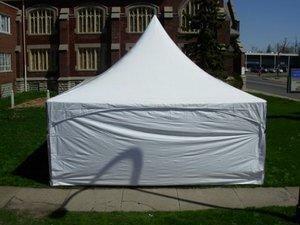 Our tent side wall kit includes 2 sides with windows (see picture #2 above) and 2 solid white walls. This is perfect for blocking the sun or wind or for more privacy. We only rent this as an add-on to our tent rentals. Please note that there is no doorway when the sidewalls are installed. Most set ups include 3-side walls with one open side. NOTE: 2 Solid walls and 2 Window walls are available. Please specify type requested when placing order. Pricing shown is price per side wall.